It’s all happening at the Eastside Arts Festival 2018! EastSide Arts Festival is back with an exciting programme for everyone to enjoy, supported by Arts Council of Northern Ireland. 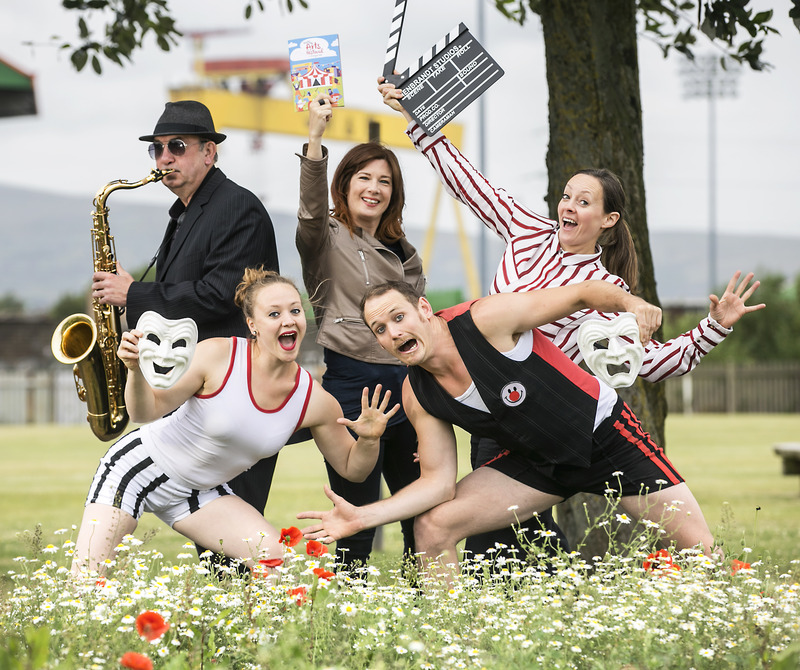 From 2-12 August, places and spaces across east Belfast will come alive with a wide range of arts activities celebrating the creative energy of the eastside. Offering new experiences and little surprises along the way, make sure you don’t miss the chance to be part of something very special! Parkfest - Two days (4&5 August), two parks and lots of FREE fun for families to enjoy. Take part in the first ever Parkfest at C.S. Lewis Square and Orangefield Park, featuring arts, crafts, performances, tandem bikes plus lots more! Music and Words – Across the festival enjoy a wide range of live music, storytelling, poetry and literature from well-known Northern Ireland artists and east Belfast residents such as Anthony Toner, Jan Carson, Ken Haddock, Stuart Bailie, and Andrea Montgomery. Theatre - Lots of exciting and interesting performances are on offer including a special rehearsed reading of Jimmy Ellis: Home Again, an autobiography by the late east Belfast actor James Ellis, of his childhood years spent in Park Avenue (2&4 August). Look out for other gems including Jade City (3-5 August) and East Belfast Boy (7 & 8 August). Comedy - Back by popular demand is the hugely popular Murder She Got Wrote off, budding Jessica Fletchers required (10 August)! Plus check out Ruairi Woods live at Strand Arts Centre (10 August) and Those Who Can’t comedy trio (3 August). Events at the Big Top - A big hit last year and back for 5 days this year is the Big Top at C.S. Lewis Square. Lots of great family fun events include circus workshops, performances (8,9,11 &12 August) and the Big Fish Little Fish family rave (11 August)! Featured music includes Celtic Soul, the definitive Van Morrison tribute, playing the iconic album Astral Weeks (8th August), Hothouse Flowers (9 August) and Camille O’Sullivan (11 August). Also look out for a special screening of The Rocky Horror Picture Show (12 August) and a late-night Circus Cabaret celebrating 250 years of Circus (10 August). Visual Art - Visit a wide range of venues including Framewerk, EastSide Gallery and Old Belfast Met Tower Street were you will be treated to some extraordinary visual art experiences from a range of local artists. A key highlight is a sleepover at St Martin’s Church, Ballymacarrett, hosted by Framewerk (11 August). Film - As well as hosting theatre and music events the iconic Strand Arts Centre will show a range of film screenings such as G.I. Blues featuring Elvis Presley ( 2 August) and The Court Jester featuring Angela Lansbury (9 August). Workshop & Classes – If you’ve been itching try something creative, here’s your chance! Come to one of the art-themed workshops with Maitri Studio (2-12 August) or join east Belfast based writer Jan Carson and write your own piece of magical realism fiction (6 August). Tours & Talks - Whether it’s by bus, foot or bike there is a tour to suit all interests. From photos of days gone by to musical and literary icons to walks in glens or greenways, or a visit to well know places, you will be surprised by what you see and hear. Back by popular demand is the Translink East West Bus Trip with Stephen Beggs and Paddy McDonnell (5&12 August). New for this year is a unique and entertaining trip on the new Glider (6, 7 &9 August), a partnership with Culturlann and Feile 30, which offers you the chance to be entertained by artists and storytellers and nourished by delicious food from across the city, all from the comfort of your Glider seat. EastSide Emerging - As part of EastSide Arts commitment to new and upcoming talent we invite you to come along and support our young musicians and producers (3 & 9 August). Special events – From a special film screening of Cocoon at Knockanagoney Community Centre (8 August) to Artful Ageing Exhibition (2-12 August) featuring creations from older east Belfast residents, to performances from artists involved in the Home Project 2018 (8 August), you are guaranteed to uncover something new about the eastside. For the full festival programme visit www.eastsidearts.net and follow the Festival on Facebook, Twitter and Instagram #ESAFest18.